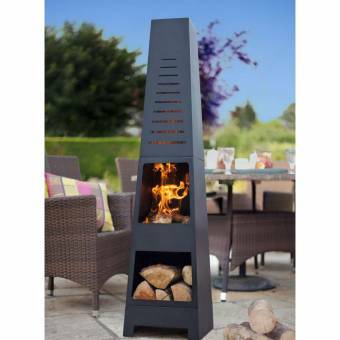 La Hacienda Skyline Chimenea - Clean lines and modern designs mean that these chimeneas are not just functional patio heaters but also a stunning feature for any urban garden or contemporary outdoor spaces. The Skyline Chimenea's laser cut design is based on a pyramid as the wide base tapers into a smaller chimney. The Skyline also has a handy log store underneath the main fire compartment giving you a convenient place to store your logs.